Physicists have recently discovered a whole quantum-based reality, a multidimensional world where all potentials simultaneously exist. 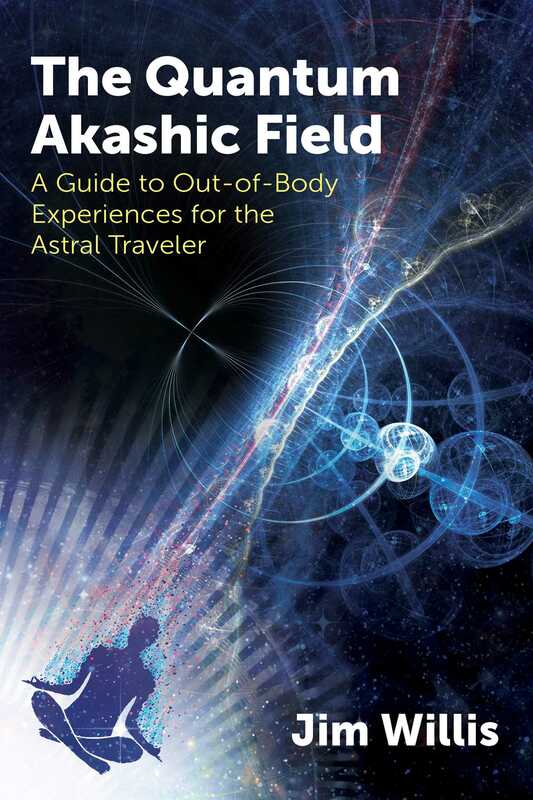 Called the Akashic Field by systems scientist Ervin Laszlo, it is the same quantum reality that mystics, shamans, and dowsers have been exploring for thousands of years through astral travel, spirit journeying, and energy work. Revealing how to gain awareness of the Quantum Akashic Field through conscious out-of-body experiences (OBEs), Jim Willis shares fascinating firsthand accounts taken from the detailed OBE journals he has kept for nearly 10 years, alongside analysis of recent discoveries in quantum physics and wisdom from the world’s spiritual traditions. He details his own experiences with a wide variety of astral beings, spirit guides, landscapes, laws, and activities that he encountered in the Quantum Akashic Field. Drawing on scientifically-based principles that underlie the very nature of biological life, he explains how the brain is an organizer, not a producer, of consciousness. He explores the difference between dreams, visions, and OBEs and powerful ways to harness the imagination. Detailing a step-by-step process centered on safe, simple meditative techniques, Willis shows how to bypass the filters of your five senses while still fully awake and aware and engage in extrasensory, out-of-body travel. Sharing his journey to connect with universal consciousness and navigate the quantum landscape of the Akashic Field, he reveals how conscious OBEs allow you to penetrate beyond normal waking perception into the realm of quantum perception. The Master Game involves the quest for spiritual awakening, enlightenment, and liberation. The goal is to discover one's own true nature and to know from direct, empirical experience that this nature is both sacred and immortal. What if someone were to tell you that your five senses of touch, sight, smell, hearing, and taste, important senses that have evolved to help you relate to and interact with the world around you, also serve as filters that cut you off from a true experience of the totality of reality? What if that person were to further explain that the scientific method, that marvelous, systematic, investigative technique that relentlessly explores, tracks down, measures, and describes the world around us, is insufficient to fully explain the nature of the cosmic ocean in which we live and move and have our very being? And what if you were to learn that almost everything you have been taught about reality is an illusion? Would you accept it? Would you believe it? Would it change your life? But the fact that you chose to even begin reading this book proves you are probably not like most people. You are curious. You sense that there is something going on beneath the surface of your day-to-day life. You have read enough to know that new discoveries in almost every scientific discipline are overturning the safe and comfortable story of existence that has been the staple of academic life for generations. You have watched enough of the History Channel on TV to begin to suspect that most religions, as practiced today, don't truly represent the teachings of their original founders. You have become aware that ancient texts, these days readily available via the Internet, offer puzzling enigmas and mysterious allusions which suggest that our distant ancestors seemed to be in touch with forces we have long forgotten--forces that may have atrophied due to disuse but still lie dormant deep within, waiting for us to access them. In this book we're going to explore some of these ideas. Together, we will seek avenues that lead to a reality outside the normal perception realm of most contemporary experience. We'll discover that what most of us have been taught is insufficient. We'll try to penetrate to the essence of the freedom that lies just beyond our waking consciousness. Call it Quantum Perception. When we, either by accident or intentional design, somehow bypass our senses while still fully awake and aware, we discover that consciousness is not a by-product of our brains. It doesn't originate in the brain at all. It is universal. The brain is an organizer, not a producer, of consciousness. It is more like a radio than a generator. Once we bypass the filters of our five senses and connect to universal consciousness outside our familiar sensory parameters, the effect can be staggering. We realize we are more than our bodies--that our bodies simply house our essence. It's as simple, and as complicated, as that. Out of Body and Near Death Experiences occur when we are able to do an end run around our highly evolved sensory filters. When we escape the prison of our senses we achieve freedom. All that is becomes accessible. We have penetrated the quantum realm. I’m fully alert, even though my body is relaxed. I try to remain calm and patient so as to let things unfold at their own rate. An image pops into my mind, totally unbidden. It’s a picture of a monkey, hopping up to a window in his cage. I notice that the window is open. There’s nothing to stop the monkey from jumping outside. I immediately interpret that as meaningful. I am the monkey and I can leave my cage--my body. Then the scene changes. I see a gate--iron bars standing between stone pillars. But the gate is open. I can walk through if I want. After some mental struggle I stand at the open gate and gaze out unto a magnificent vista. Way below me is a whole universe of towns and villages. I ask to change into a hawk so I can fly over the whole thing and see it from above. When that doesn’t happen I ask to fall into it--toward it. I await some spectacular result. But then it occurs to me that even this, as magnificent as it is, is a mental construct of my own. So I ask to see Reality, not my own idea of reality. Suddenly the whole image rolls up like a scroll. For just a second I stare into a huge nothingness. I experience it as music--walking into music. For one, brief moment, I am aware of a tremendous pulsing throughout the core of my body. My heart and chest are pulsing--there is no other word that quite describes it. It’s not uncomfortable at all. If anything, it's just the opposite. The feeling is wonderful. I feel it, and am conscious that I am feeling it, and it feels profoundly peaceful. I really don’t want it to end, but I realize that my journey for today is almost over. I went a little farther than ever before, and have the feeling that’s the way it’s going to be. Each day, one more step. Gradually. Inch by inch. Unseen worlds glimpsed in dreams and visions comprise the very realms, spruced up with newly minted scientific vocabulary, that shamans, dowsers, and mystics have been exploring for thousands of years. And it’s closer than you can imagine!